Can These Guys Be Serious? It's not easy being a fake newsman in 2010: reality keeps stealing your best material. Take, for example, the argument that Campbell's new line of halal soups is a sign that Shari'a law is infiltrating the U.S. Funny, except that it's an actual argument, made by real-life political bloggers, including the group Tea Party Nation in early October. On the Oct. 11 Colbert Report, faux pundit Stephen Colbert ran with the idea of hostile Muslim food: "Is it any coincidence that bananas are crescent shaped?" Now that's parody. But just barely. 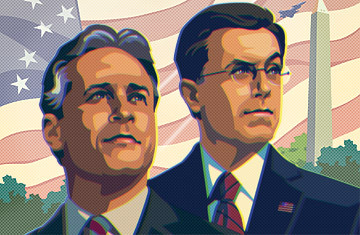 So it may be out of self-preservation that Colbert and fellow comedian Jon Stewart are heading to Washington with a message about our overheated national dialogue: It may be Tea Party time, America  but would you consider switching to decaf? The thesis, as Stewart explained it on the air, is that the national conversation has become dominated by the loudest, craziest 15% to 20% of Americans  the Koran burners, the flag burners, the truthers, the birthers, the town-hall screamers, the folks who compare opponents to Hitler or the Taliban  and that they're rewarded with attention from journalists and politicians who should know better. (Of course, they're also rewarded with attention from Stewart and Colbert, who owe their careers to skewering such craziness and meta-criticizing how other media cover it.) The day before Halloween, Stewart declared, is for "not so much the Silent Majority as the Busy Majority," people "who think shouting is annoying, counterproductive and terrible for your throat." In other words, two comedians are taking it upon themselves to say America is making itself look ridiculous. They're taking a risk in doing it. Idealism can be the death of funny, which is why, as Stewart himself has put it, comedians "don't lead a lot of marches." But the very attempt demonstrates that the cable comedy hosts have become the most relevant voices in late-night TV. For a while now, Stewart and Colbert have been bigger than the half hours that contain their shows. In 2004, Stewart went on the CNN shoutfest Crossfire and blasted it for "hurting America"; the network canceled the show a few months later. Stewart has demolished financial pundit Jim Cramer, done cruelly accurate imitations of Glenn Beck and appeared on The O'Reilly Factor to slam Fox News as a "cyclonic perpetual-emotion machine." In 2006, Colbert roasted President George W. Bush and the White House press corps to their faces, guerrilla theater  style, at the White House Correspondents' Association dinner. In September he testified in character before a House subcommittee on immigration: "My great-grandfather did not travel across 4,000 miles of the Atlantic Ocean to see this country overrun by immigrants." If Stewart and Colbert are moving further into the public arena, though, fair's fair: the public arena has been moving further into comedy. A pro-wrestling executive is running for the Senate in Connecticut. In Delaware, Republican Senate nominee Christine O'Donnell's campaign ad begins, "I'm not a witch." In West Virginia, Governor Joe Manchin, a Democrat running for the Senate, aired an ad in which he fires a bullet through a copy of the cap-and-trade bill. That's the state of American political discourse in fall 2010. A popular governor decides to prove his suitability for national office by going out into a field and shooting a law. (Suddenly, Ronald Reagan's bear-in-the-woods ad seems much more subtle.) And why not? Clearly some political pro decided that Manchin needed to appeal to that 15% of people who, as Stewart might say, want their leaders to shoot first and study policy papers later. See the top 10 Facebook stories of 2009.